Wow...third post in 2 days... it's a miracle! Welcome to this month's installment of the Stamp of the Month blog hop where approximately 60 CTMH consultants show off our artwork using April's stamp of the Month : You Are. If you've arrived here from Elizabeth's blog- you are headed in the right direction and the next link in the loop is posted at the end of this one. If you are just joining the hop here- no problem... it should circle around to all of the blogs in the hop. I had soooo much fun with this set. First up is the stamps themselves and a reminder- Our Stamp of the Month sets are $17.95 but when you spend $50 or more you can purchase the set for only $5. 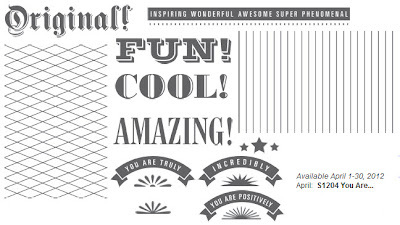 Or you can hold off till April 17th and that $50 purchase will earn you this set for $5 AND the awesome National Scrapbooking Month special of 24 sheets of fabulously designed paper (2 each of 12 designs) for another $5!!! More on that special...including artwork... will be posted leading up to the 17th of April when the special begins. Up next is my artwork. I was inspired by the artwork shown in our Spring/ Summer Idea Book and those of you with a copy will notice that the left side is similar. I've put my own spin on the colors and I totally guessed on their sizing. The second side is all mine. I wanted a 2 page layout for my daughter's soccer photos. Since I have dial up- I have to physically go to the store to have my photos printed and I ran out of time BUT... I know we already have a 5x7 verticle of her soccer photo, and a 5x7 horizontal of her team photo. I anticipate printing 2 3.5x 5 photos to go above the journaling/ purple rectangles on the left page. I will print several photos to line up on the grey piece on the right side. Once I get the photos printed... I will re-post the completed layout. On this first side- the vertical 5x7 will completely cover the non-stamped white... in between the grey borders. I used my cricut to cut all of the stars- and one scalloped circle that was cut and used on both pages. Colors: Black, White Daisy, Gypsy and Grey Wool. I LOVE the banner I cut for this page. I inked up each letter of the "cool" stamp individually and made sure to clean any stray ink off surrounding stamps- to stamp one letter per banner. It's hard to tell but my white and grey papers are sponged with either purple or black inks. So there you have it- my April stamp of the month layout is all ready for some purple-uniformed soccer photos! Up next- Visit Melinda's blog to see what she's created. Boy, that Gypsy really pops on your pages! I see I'm not the only one doing soccer pictures with this set! Can't wait to see the LO with your pics on it. Great job! Love the colors. Nice layout. I especially like the banner. Love this color combo and the background stamp rocks! I LOVE purple! This is a great color combo that you put together!